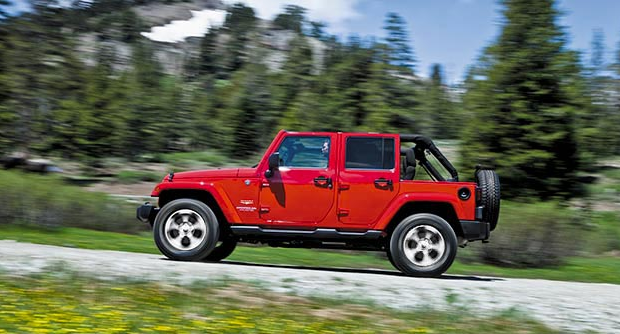 At Davis Dodge, we've got the three-time winner of Ward's '10 Best Engines' in the Jeep Wrangler! The Jeep Wrangler gives you the freedom to go anywhere, do anything. Discover it all, from downtown to the back woods and on every adventure. 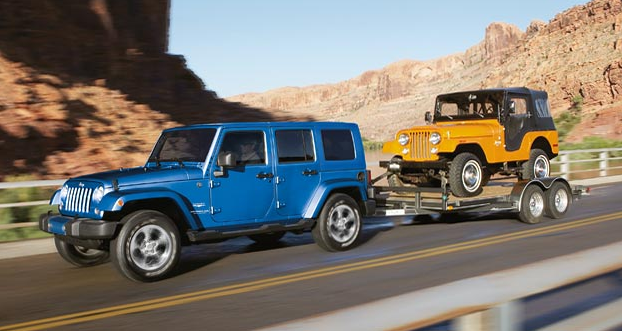 There are lots of different Wrangler Models to choose from! The Sport, Sport S, Willys Wheeler, Unlimited Sport S, Unlimited Willys Wheeler, Sahara, Unlimited Sahara, Rubicon, and Unlimited Rubicon. Talk with one of our representatives today, and learn why vehicle buyers come from Calgary, Lethbridge and Pincher Creek for a shopping experience at Davis Dodge. The centre console bin adds to the impressive storage space with its wide opening size, comfortable height for easier access and a dual-stage lid tray. Plus, it's lockable so your valuables are secure even when the top is down. 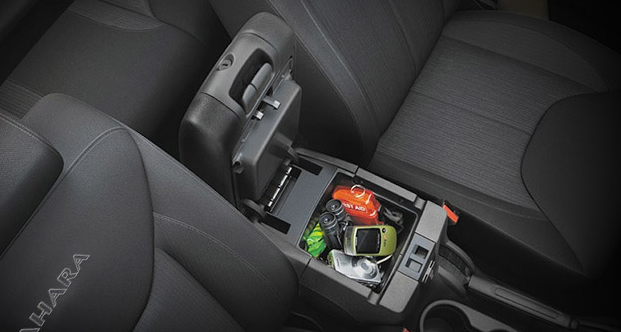 Soft to the touch, the stack flows seamlessly to the centre console, providing loads of storage space. Whenever the temperatures dip, tackle it in comfort with the available heated front seats (standard with leather-faced seating). 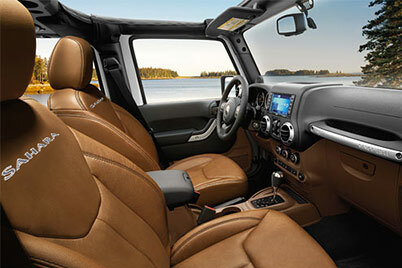 The Jeep Wrangler interior makes cleanup easy. Open the floor drain plugs, remove the floor carpets, wash it clean and it's ready to go. The reversible rear cargo mat protects your carpets and the rear in-floor storage bins offers convenient places for your gear. 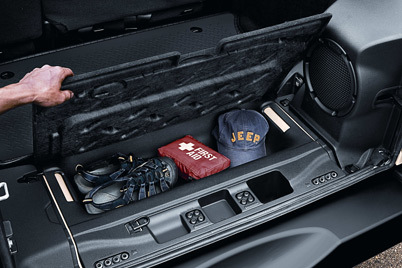 There's also a lift-out tray for door and hardtop bolt storage. Choose from full-framed metal or half-metal removable doors and hardtop or soft top roof options17, and configure the Wrangler to match your adventurous style. You can also have both roof options with the available Dual Top Group. 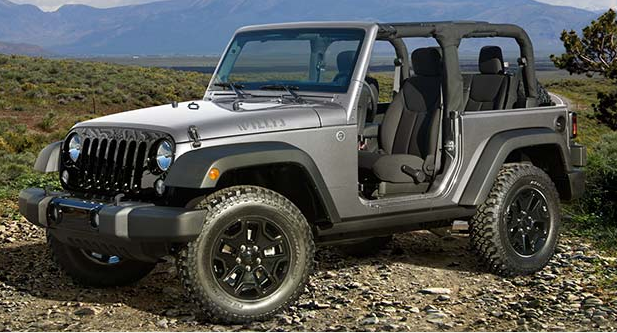 Removable full-framed metal doors featuring rugged aluminum-forged hinges are standard on the Wrangler. 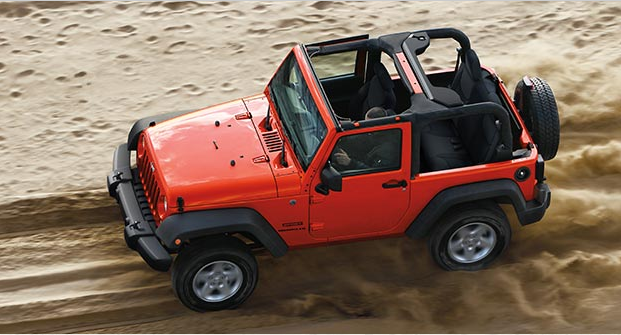 The Sahara® and Rubicon® also feature standard power windows and doors. All doors include convenient map pockets with open slots along the lower edges for easy cleaning. The Sport S and Unlimited Sport S feature available half-metal doors with manual locks that are completely removable for the ultimate in open-air adventure and freedom. 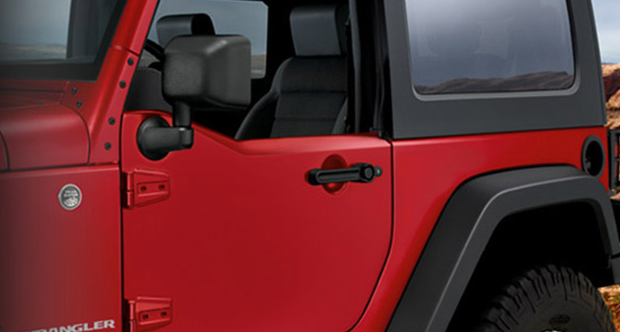 Removable full-framed metal doors17 featuring rugged aluminum-forged hinges are standard on the Wrangler. 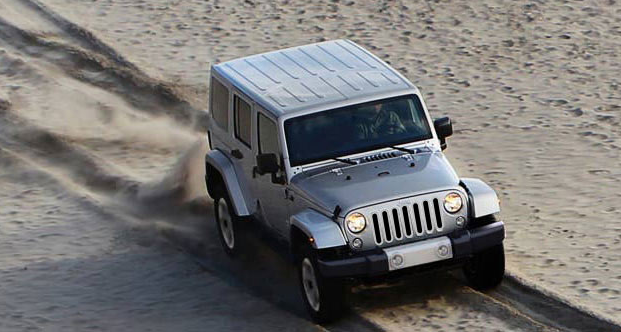 The Sahara® and Rubicon® also feature standard power windows and doors. All doors include convenient map pockets with open slots along the lower edges for easy cleaning. 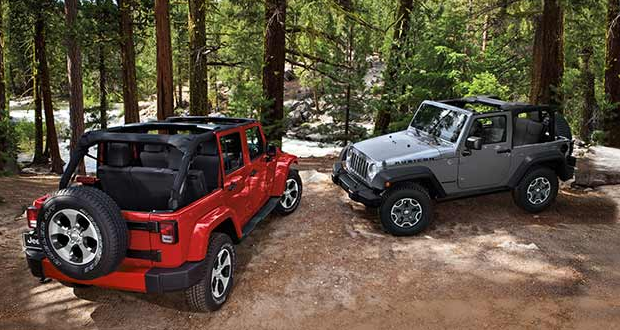 Featuring larger rear and side windows, the innovative Jeep® Freedom Top® hardtop is available on all Wrangler models. On the Sahara® and Rubicon® models, you can also match the hardtop colour to your Wrangler with the available body-colour option. 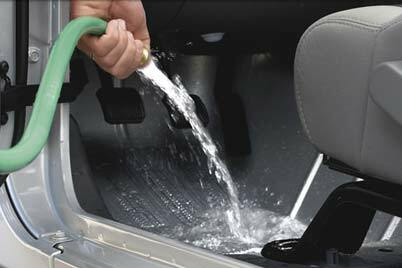 The standard Sunrider® Soft Top features large rear windows, is easy to remove and store, and opens quickly through a convenient cable release. It is constructed from quiet and watertight 3-ply material and completely folds down and tucks away when you want an open-air drive. For added good looks, opt for the premium Sunrider Soft Top. It adds durability and sound dampening for a quieter ride. Plus, a dust blocker helps keep your premium soft top in tip-top shape and easy to wash. 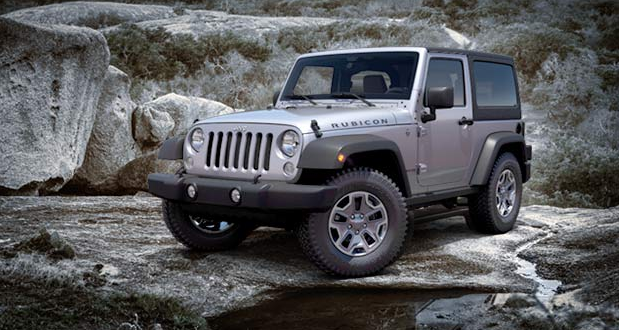 The Jeep® Wrangler Sport model features 16-inch slot-spoke styled steel wheels, the Sport S rides on tough 17-inch Moab Sparkle Silver aluminum wheels and the Sahara® has commanding 18-inch polished aluminum wheels with new Granite Crystal painted pockets. The Rubicon® models are equipped with 17-inch polished aluminum wheels with Mineral Grey painted centre riding on beefy 32-inch BFGoodrich® tires. On the outside, the Jeep® Wrangler wears its legendary heritage with pride. There's the iconic 7-slot grille, exposed door hinges, fold-down windshield, short front and rear overhangs, and trapezoidal wheel arches. 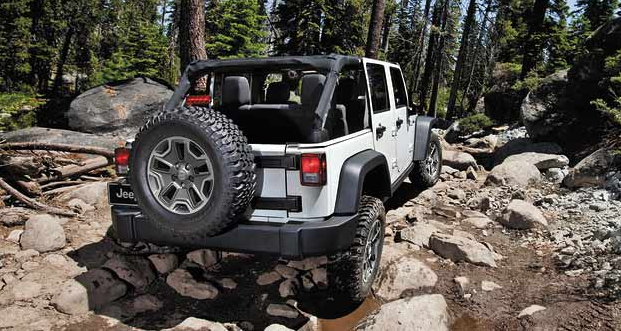 It's a style that reinforces the Jeep rugged functionality and purpose-designed character. The convenient Torx® toolkit is standard on every Wrangler model. It makes door, hardtop and soft top removal a breeze. This 3-piece set comes in a Jeep®-branded carrying pouch with durable, laminated instruction cards explaining how to remove and install the doors and hard/soft tops. 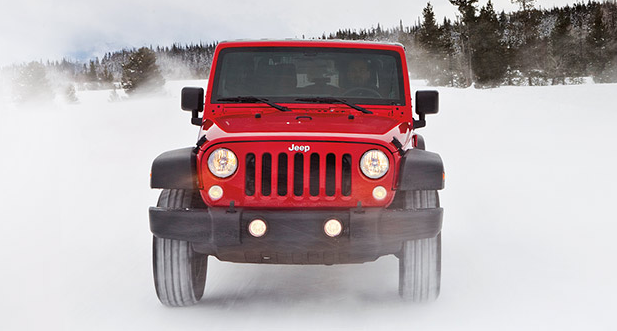 The 2016 Jeep® Wrangler delivers impressive fuel economy as efficient as 11.0 L/100 km (26 mpg) highway45. Sport and Sahara® models feature this 2-speed transfer case that offers part-time 4WD capability for smooth, quiet operation, and enhanced reliability with manual operation. The Command-TracTM shift-on-the-fly feature allows you to quickly change between 2WD and 4WD, and the 2.72:1 low range gives you the capability to crawl over rocks. This high-performing package provides an impressive 3.73 rear axle ratio, a Class II receiver hitch and a 4-pin connector. 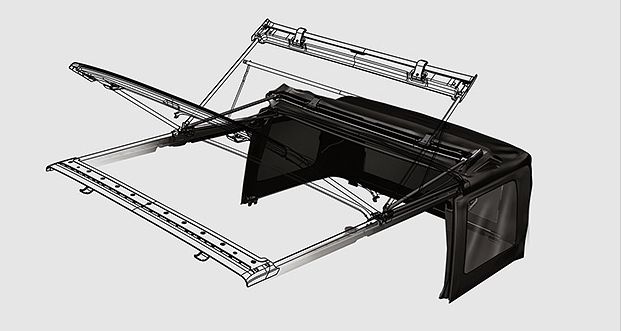 When equipped, the towing capacity reaches up to 1,588 kg (3,500 lb). Available on Unlimited Sport S, Unlimited Sahara® and Unlimited Rubicon®. The available heavy-duty suspension incorporates solid axles with locating arms, coil springs, track/stabilizer bars and front steering damper. Tunable monotube shock absorbers are firm at low speeds for improved feel on rougher ground and deliver a more relaxed ride at higher speeds. 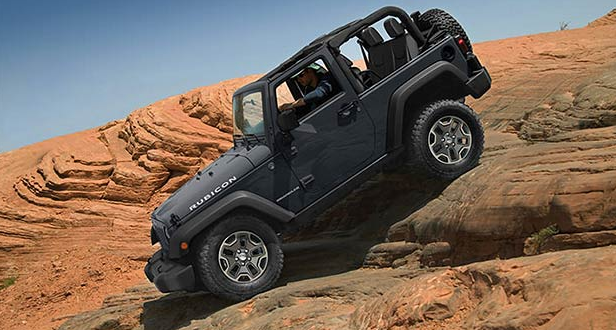 The Jeep® Wrangler is engineered to be the ultimate adventure machine and Rubicon® goes where others fear to tread. Thanks to its Best-in-Class ground clearance, approach angle, departure angle and manoeuvrability, Rubicon takes the path less travelled. The renowned Rock-Trac® transfer case, standard on Rubicon, features a 4:1 low-range gear ratio for precise control, and incorporates Tru-Lok® front and rear locking differentials, electronic front sway bar disconnect and Dana® 44 heavy-duty solid front and rear axles. 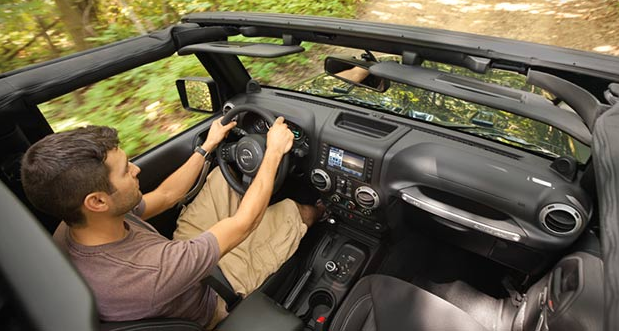 The Jeep® Wrangler is equipped with a 4-wheel antilock disc brake system (ABS) that's specially calibrated for off-road, 4-wheel-drive conditions. 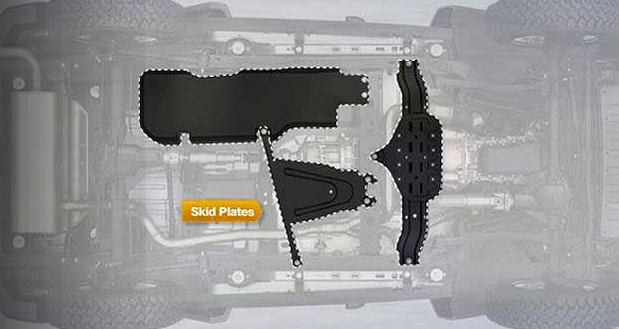 Whether it's from highway debris or rocks on a gravel trail, skid plates help protect the underside of your vehicle. Front suspension and drivetrain plates are constructed of 3-mm-thick stamped steel and include an automatic transmission skid bar (not shown) that protects the transmission oil pan, a transfer case skid plate and a fuel tank skid plate. Be safe and legal when using the phone while driving. This available voice-activated communication system allows you to talk on your Bluetooth®-compatible phone virtually hands-free. 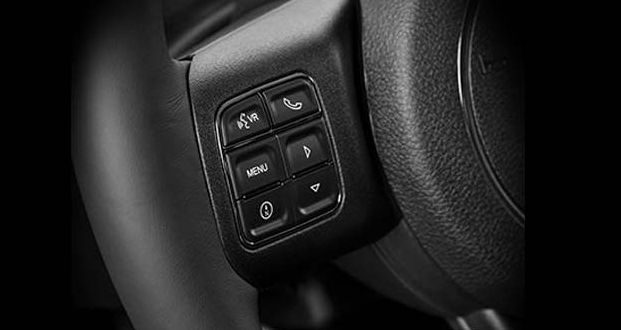 You can even initiate a call from your steering wheel and synchronize with your phone's contact list when you get into your Jeep® Wrangler. 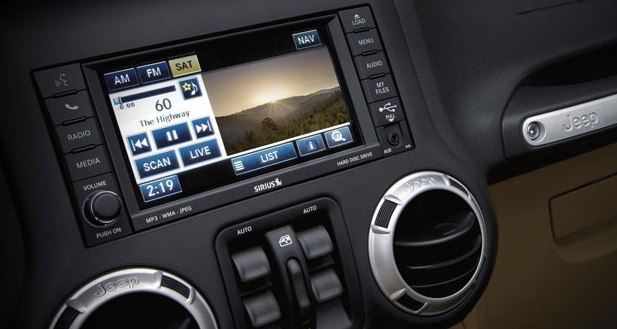 The Wrangler keeps you connected and in control with innovative entertainment and communication technology. These available multimedia centres feature a 6.5-inch touchscreen, MP3 compatibility, the capacity to store thousands of songs, and an auxiliary input jack. To help get you where you're going, select the Radio 430N multimedia centre with Garmin® Navigation. Bring a quality soundtrack to every drive with the available Alpine® Premium Audio System. 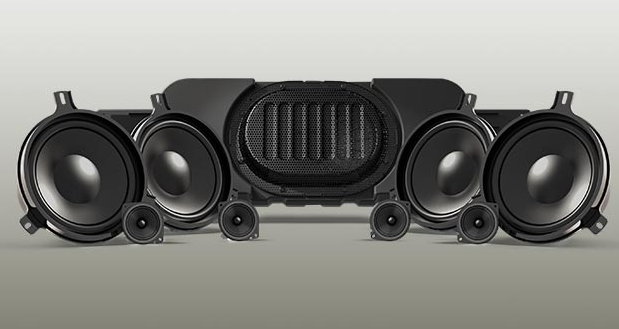 It powers your music with 9 speakers and an all-weather subwoofer for added durability during open-top adventures. 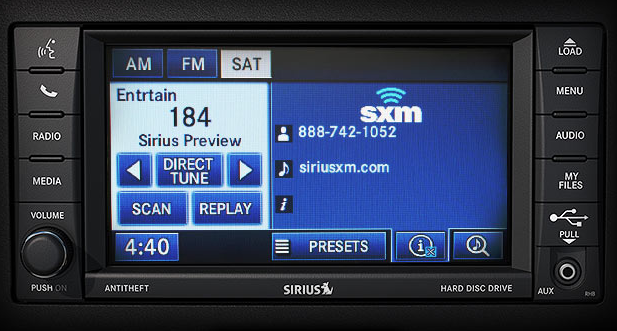 Enjoy commercial-free music and premium-quality radio with available SiriusXM satellite radio. It's factory-installed and includes a one-year subscription, so you can choose from 120 channels featuring sports, music and much more. The Wrangler employs collapsible, hydro-formed front rail tips for low-speed protection that can be serviced after impact events of up to 13 km/h. This advanced system is engineered to assist you in maintaining control of your vehicle. It utilizes hydraulic Brake Assist, All-Speed Traction Control, Electronic Roll Mitigation and Trailer Sway Control to constantly monitor driver input against the vehicle's actual course. 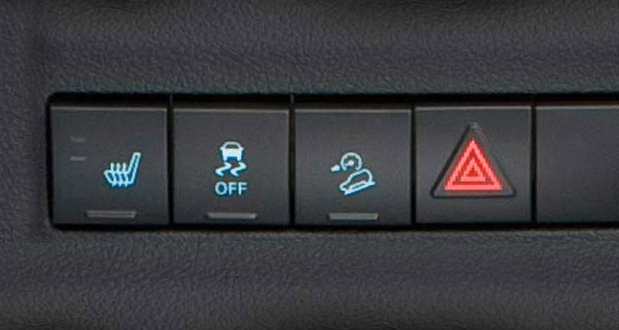 This feature prevents the vehicle from rolling away when starting on an uphill or downhill gradient. It holds the vehicle stationary for 2 seconds after the driver's foot is removed from the brake pedal, allowing time to apply the throttle. 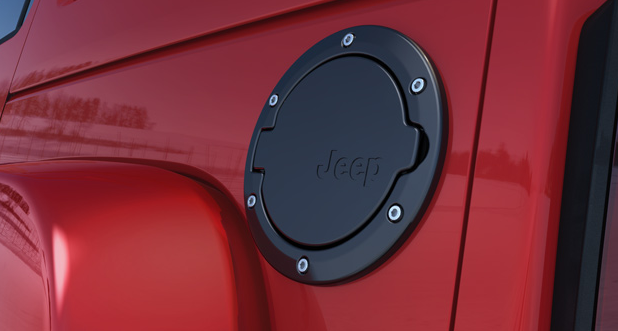 Every Jeep® Wrangler has a mid-mounted fuel tank for enhanced safety. By placing the tank between the wheels and behind the protective skid plate, the potential for a fuel tank rupture is greatly decreased. 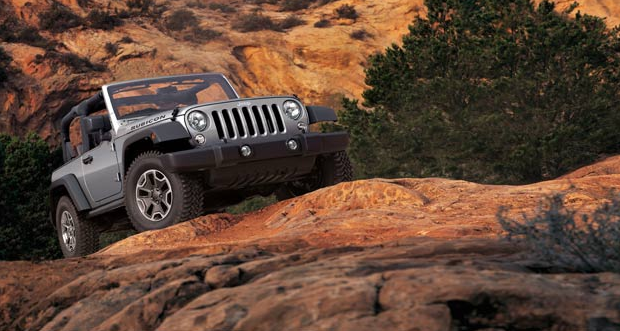 Take a look at the Jeep Wrangler today!